This report shares findings and provides perspectives for partnerships to consider as they seek to build their capacity to survive and to thrive over time. It contains questions for partnerships to consider in building these capacities. 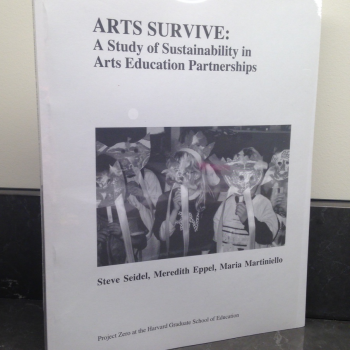 Including sketches of the twenty-one arts education partnerships selected for this study, bibliographic resources, a research context for the study, and reflections from many Arts Survive! Advisory Group Members and Senior Consultants, the report provides tools for promoting the long-term sustainability of arts education partnerships between schools and arts organizations, artists, and/or cultural institutions. Whether you are an artist working in the schools, a teacher, an arts administrator, a parent, a school administrator, a school board member, or a funder, we hope these tools will be useful as you consider how best to sustain the life of your arts education partnership. Executive Summary of Arts Survive!